Norfolk, Congham Hall Hotel (01485 600250; www.conghamhallhotel.co.uk) has updated its winter nature trail, which is designed to help guests make the most of the wildlife and landscapes of Norfolk during the colder months. 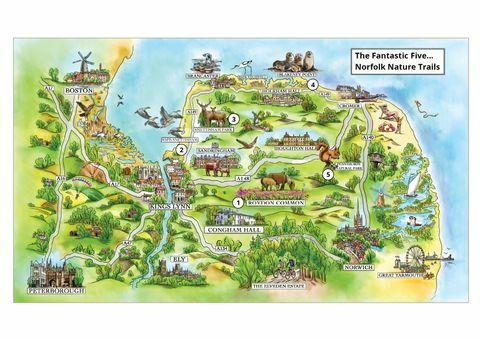 The Fantastic Five… Norfolk Nature Trail recommends the area’s best seasonal assets, which include one of the UK’s biggest wildlife spectacles, the migration of more than 40,000 pink-footed geese to the Wash. The grey seal pups, born at this time of year on the shingle at Blakeney Point, are another highlight. The free trail, available from Congham Hall’s reception and downloadable from the Out & About in Norfolk section of the hotel’s website, now includes a self-guided ramble across nearby Roydon Common, the largest surviving open heath in the area and a Site of Special Scientific interest. Downloadable, along with the rest of the trail, the easy, three-mile walking route starts from the hotel and takes in Grimston Warren as well as Roydon. Walkers can expect to glimpse Dartmoor ponies, hares and British white cattle grazing on the frost-covered heather, while Hen Harriers, Merlin and the Great Grey Shrike might also be spotted in the skies. A family-friendly deer safari at Snettisham Park and the high-wire antics of red squirrels at Pensthorpe Nature Reserve complete the trail. The hotel has a Winter Nature Offer to complement the trail. Guests who book a two-night midweek stay, will pay from £394 per room, including dinner, bed and breakfast – a 10 per cent saving on the usual price. The offer is available to book Sunday to Thursday, from 1 November 2017 to 28 February 2018, subject to availability (excludes 22 December 2017 to 3 January 2018), when quoting “Winter Nature Offer”. For further information, images, or to arrange press trips, please email: travelnews@traveltappers.co.uk. Alternatively, contact Simone Kane on 07811 161839 and simone@traveltappers.co.uk and Kate Simon on 07939 526109 and kate@traveltappers.co.uk. Traveltappers is a trading name of Little Black Book Creative Ltd.
Room rates start from £135 per night, room only, and £219 per night for dinner, bed and breakfast. Relaunched in May 2013, the 26-room Congham Hall Hotel sits in 30 acres of parkland, including orchards and its renowned Herb Garden, which has 400-plus varieties and attracts visitors from far and wide. The modernised, 2 AA Rosette, bistro-style restaurant features much homegrown produce on its menu and benefits from a sophisticated bar.